This is a favourite salad that we always have on the Christmas table, so easy to make with fresh seasonal ingredients. Add prawns to pan and sprinkle over the paprika, cook 3 minutes each side or until cooked through. Place all ingredients in a jar and shake vigorously to emulsify. Adjust honey and seasoning to taste. This dressing makes quite a lot so only put on as much as you need. The left dressing will last for 4-5 days in the fridge. 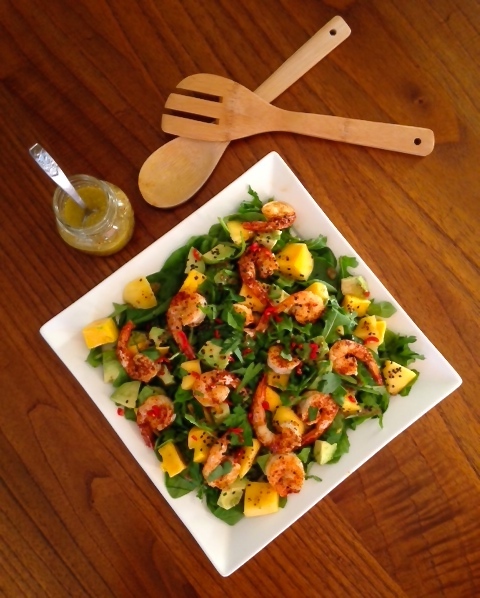 Place rocket, spinach, mango and avocado on a large plate. Add prawns to salad plate whilst still warm. To serve sprinkle over chopped chili, parsley, sesame seeds and drizzle over the dressing.